A couple of clicks and then all of my messages are lined up like the dishes at a Chinese buffet. I always scan new email by sender, filtering out my friends from the advertisers. It is always fun to see who is thinking of me. Their names bring back mostly good memories. Days at summer camp when we were thirteen or the hot sand at a Florida beach and the roller coaster we must have ridden a dozen times. Or maybe it was a trip we took together to see the famous museums in Europe or late nights in the dorm room talking about girls. Each name has a place in my past and brings with it those memories. It is kind of like a favorite smell or a favorite music tune and the memories they trigger. For example, cinnamon always reminds me of Christmas. Apple pie and pumpkin pie remind me of Autumn, my favorite time of year. The tangy smell of BBQ suggests the long lazy days of summer. When it comes to tunes the song, Breakfast at Tiffany’s by Deep Blue Something, reminds me of a girl I was infatuated with in high school. The Bangles’ Eternal Flame reminds me of the Fall of my junior year. When I hear Eye of the Tiger my heart races just like it did so many years ago when I was about to step out on the basketball court right before a game. A few weeks ago, I received an email from an old girlfriend from Japan. Her name immediately brought back feelings of nostalgia. It was flashes of driving down narrow streets, of stacks of lunches at convenies (convenience stories), of boys and girls in school uniforms and rice fields waving in a brisk wind. Her name also briefly brought up those old feeling I had for her, though now they are more a memory than a feeling. Still, her message title caught me by surprise. “Just married! !” I knew it was coming, but the title (and then her email) told me it was official. The shock wasn’t so much from a sense of loss, but more a sense of how I once thought that was going to be me. If you are like me, when you date someone, there are times when you imagine them as your husband or wife. A time or two, I thought about that particular girl being my wife and of having children with her. I made other choices, but we still keep in touch with occasional emails with the latest news. This news of her marriage (and her pregnancy!) made me catch my breath though. I suppose it was because I was holding on to that special memory. I suppose we all have to let go someday, of even the memories. The trees would probably wish to keep their leaves. 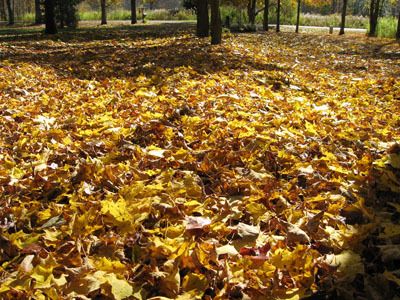 Yet, with every cold night they let a few more leaves flutter to the ground. God has good plans though even in the midst of that loss. The winter comes and everything feels dead, but it is only to prepare for a new layer of growth, of new inches of height and new shades of green to come. And for that I am excited.